Make sure the multivitamin/multimineral you take passed our test and is best for you! 12 multivitamins contained much less (as low as 24%) or much more (as high as 157%) vitamin A, vitamin D, folate from folic acid, and/or calcium than listed on labels. 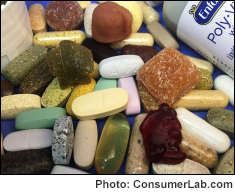 Many supplements exceeded upper tolerable intake levels — possibly doing more harm than good. Four multivitamins in tablet form failed to break apart within the required time. One needed 3 hours to fully disintegrate, 5 times the time allowed -- jeopardizing the absorption of its ingredients. Fortunately, we also identified many high-quality multivitamin/multimineral supplements. Those that also provided good value were chosen as our Top Picks -- some of which cost just 3 or 4 cents per day.